Do you have questions, articles, pictures, news, training tips or any information pertaining to Labradors. Would you like us to do a dog product review? Send us an e-mail and I will gladly post them on this blog and try to answer any questions you may have. I love blogging and writing which I share with other members of my family. Thanks to my sister-in-law, Sammie Pucci for all her help with all of our blogs and to our other family members who get no credit working hard behind the scene. Labrador retrievers have been one of the most popular adoption dog breeds in America for the last twenty years. This large and lovable creature makes for a companion that will keep you company, especially when you’re feeling a little under the weather. So, what happens when your Labrador is feeling a little sneezy this fall season? Allergies are on the rise for people and dogs alike, often resulting in itchy, sneezing, and runny nose signs. We don’t always consider our companion to have such problems, but it is far more prominent than one might think. A dog suffering from allergies show a variety of signs, such as red eyes, dry and flakey skin (dandruff), along with a runny nose. In some cases, they may even have diarrhea or vomiting issues. This could result from many causes, from food to fleas and so much more. As your dog’s owner and protector, it is your duty to be aware of what is going on in your dog’s body and the best ways to address these issues so they can get back to sniffing around without sneezing everywhere. Dust, pollen, and even the debris released during the fall season’s dropping leaves and late blooming can irritate anyone’s allergies. These can cause a dog’s eyes to turn red and their nose to run. Sneezing is commonly associated, especially if they are lying on their back waiting for a belly rub. There are other outdoor issues, such as fleas which can also stimulate allergic reactions. Normally, the irritation would be limited to the area of a bite, in which case the best method of treatment is to keep the fleas and ticks off them in the first place. Skin allergies are hardest to spot because of a dog’s coat. Redness and swelling may be hidden by fur, so it’s always good to inspect your dog’s skin regularly. This is especially important if they are scratching or nibbling at a specific area constantly, such as paws, hind end, or ears. But, if skin allergies persist, dietary supplements such as omega fatty acids and brewer’s yeast can help keep their skin moist and healthy to help reduce the irritation of allergic reactions. Allergic reactions are normally on the outside, but dogs can eat foods that don’t agree with them as well. Dogs are renowned for their hearty appetites and will eat indiscriminately, which means they won’t necessarily stop eating it just because they’re allergic to it. If your dog is having issues with diarrhea or is vomiting, double check their diet. This is especially true during social events where people tend to sneak a dog some human food. Foods like tomatoes and melons tend to lead to allergic reactions in dogs as well as humans. This can often lead to trouble breathing and swallowing, so be prepared to treat your dog’s reaction. In emergency cases, dog allergy medication is the best bet. These often contain diphenhydramine HCL (Benadryl). Be sure to consult with your vet to ensure proper dosage and help target the allergic reaction. The Labrador retriever is a magnificent friend, but allergies can definitely put a damper on anyone’s day. Be sure you pay attention for any behavioral changes in your dog and address them accordingly to ensure they stay happy and healthy in their home. Brandon Kennington is the inventor and owner of the Porch Potty – the world’s first automatic grass dog litter box. As dog owner and a busy business owner, Brandon invented the Porch Potty when he didn’t want his dog to have to wait all day to go. Porch Potty admires dog owners and also provides great tips for dog lovers on the Porch Potty Blog. Disclosure: This post contains affiliate link(s), which may result in compensation for AllAboutLabradors.blogspot.com. For more information about All About Labradors please read our Disclaimer and Disclosure Policies. We've shared this information to inform you of your option to either use our affiliated links or to go directly to the site of interest. New clients to VCA Animal Hospitals can get a coupon good for Free Initial Pet Health Exam. VCA Animal Hospitals operate more than 520 animal hospitals in 41 states across the nation in the VCA network. These hospitals are staffed by over 1,800 fully qualified, dedicated and compassionate veterinarians. The Free Initial Pet Health Exam coupon is good for up to two pets (dogs or cats only) per household and redeemable only at a general practice VCA Animal Hospital. Find your local Free Free Initial Pet Health Exam at VCA Animal Hospital locations. The wonderful black Labrador Retriever in this video goes by the name of Teo and was sent in by Nenne Effe (USA). "Teo, our 3-year-old black Lab, loves to eat. He’s waited all summer for the grapes to turn dark, so he can do his own private harvesting. You can see him in action in this video!" Thanks for sharing the funny video of Teo!! Kasel Associated Industries Recalls Boots & Barkley American Beef Bully sticks Because of Possible Salmonella Health Risk. FOR IMMEDIATE RELEASE - September 21, 2012 - Kasel Associated Industries of Denver, CO is voluntarily recalling its BOOTS & BARKLEY 6 COUNT 5 INCH AMERICAN BEEF BULLY STICKS product because it may be contaminated with Salmonella. Salmonella can sicken animals that eat these products and humans are at risk for salmonella poisoning from handling contaminated pet products, especially if they have not thoroughly washed their hands after having contact with the pet products or any surfaces exposed to these products. Healthy people infected with Salmonella should monitor themselves for some or all of the following symptoms: nausea, vomiting, diarrhea or bloody diarrhea, abdominal cramping and fever. Rarely, Salmonella can result in more serious ailments, including arterial infections, endocarditis, arthritis, muscle pain, eye irritation, and urinary tract symptoms. Consumers exhibiting these symptoms after having contact with this product should contact their healthcare providers. Pets with Salmonella infections may be lethargic and have diarrhea or bloody diarrhea, fever, and vomiting. Some pets will have only decreased appetite, fever and abdominal pain. Infected but otherwise healthy pets can be carriers and infect other animals or humans. If your pet has consumed the recalled product and has any of these signs, please contact your veterinarian. The recalled American Beef Bully Sticks were distributed nationwide through Target retail stores from April through September 2012. The product comes in a clear plastic bag containing 6 bully sticks marked with bar code number 647263899189. Kasel Industries is recalling all lot numbers because the following lot codes tested positive through analysis by the State of Colorado Department of Agriculture: BESTBY20APR2014DEN, BESTBY01JUN2014DEN, BESTBY23JUN2014DEN, and BESTBY23SEP2014DEN. No illnesses have been reported to date in animals or humans in connection with this problem. The recall was the result of a routine sampling by the State of Colorado Department of Agriculture which revealed that the finished products contained the Salmonella bacteria. The company has ceased the production and distribution of the product while FDA and the company continue investigating as to the source of the contamination. No other products made by Kasel Associated Industries are included in the recall. Consumers who have purchased the 6 count 5 inch packages of Boots & Barkley American Beef Bully Sticks are urged to return it to the place of purchase for a full refund. Consumers with questions may contact Kasel Associated Industries at 1-800-218-4417 Monday thru Friday from 7am to 5pm MDT. Labrador Retrievers are loved the world over for their winning personalities and superior abilities; it is hardly any surprise that they make such wonderful additions to the family environment. 1. Protector - A Lab has an intimidating appearance, weighing up to 80 pounds with a sculpted body and chiseled chest, quite capable of deterring strangers yet still maintaining that lovable personality. They are intuitive about people, always on alert and have a loud authoritative bark to keep the property parameters well protected. 2. Guardian - A young child playing in the backyard or making that first trip by himself to the mailbox under the watchful eye of the family's Lab sets parents at ease and keeps them safer. There is a very good reason they are called "retrievers." 3. Teacher - Older children can assume responsibility for the training of the family lab and acquire good skills in leadership, commitment and following through. Also, the process of training creates a good example for kids to understand the relationship between behavior and reward for themselves, such as the one between homework and good grades or housework and a fair allowance. 4. Referee - Labs don't like chaos and disorder and have a keen sense of how things should be; bickering children will promptly be barked at, in an attempt to restore order in the household and keep the peace. 5. Companion - Labs are one of the most consistently even-temperament dogs there are. With few exceptions, they are easy-going, and the only fierceness they are known for is in their loyalty. 6. Fitness coach - Labs need plenty of exercise, and in the process the human family members will burn off quite a few calories! Everyone will benefit from the workout a Lab provides, so long as he receives at least half an hour of vigorous exercise every day. 7. Low maintenance beauties - Other than the occasional bath, Labrador Retrievers don't require much grooming. The short hair manages itself and makes caring for them a breeze. 8. Outdoor adventure - Usually a family vacation means boarding the family pet, but with labs, if the intended destination involves camping, hiking or anything else in the great outdoors, he can tag along! Labs are unlikely to get lost, frighten other vacationers and serve as excellent guides through any type of territory. 9. Comedian - Labrador Retrievers add a special blend of humor to any household; although quite adept at training and work, they know not to take themselves too seriously and will always find ways of making people smile. They also have an uncanny ability to ease tensions, being pretty persistent in their silliness. 10. Hero - For an only child, a single-mom up cleaning after her kids are in bed or any other member of the family, Labs are unabashedly loving and extremely generous with their affection. They show you how much they appreciate and value you on a non-stop, no strings attached basis; what more could you want in a relationship? There are nearly as many reasons for getting a dog as there are breeds, but for the all-purpose, dependable and loyal family pet, Labrador Retrievers take the cake hands-down! This guest post is contributed by Debra Johnson, blogger and editor of Liveinnanny.com. She welcomes your comments at her email Id: - jdebra84 @ gmail.com. 1. Bathe your dog frequently with natural shampoo. Bathing your dog frequently can go a long way in bringing it relief from skin allergies. Some dog shampoos, however, may have many chemicals and additives that could make your dog's allergies worse. Be sure that you purchase a shampoo formulated for dogs with natural, allergy relieving ingredients like aloe, oatmeal, and essential oils. 2. Adjust your pet's diet. You'd be surprised by how often dogs have allergic reactions simply from what they're eating. Unfortunately, most dog foods that are commercially produced can contain certain ingredients that are common allergens for dogs, like grains and food additives. Look for dog food that contains as few ingredients as possible, and try different types of protein (beef, chicken, lamb, duck, or venison) to rule out an allergy to any of these proteins. 3. Consider fish oil supplements. Fish oil is a great way to relieve your dog of skin allergies and leave her with a thick, shiny, luscious coat. Of course, do consult with your vet before giving your dog any sort of supplement. Typically, human fish oil supplements work just fine. Your vet should know what the best dose should be. An occasional can of sardines can also have the same salubrious skin effect as fish oil supplements. 4. Take steps to keep your home allergen free. Just as many allergens exist outside as inside, so be sure to do your best to control the environment you can control—inside your home. Try using an air filter, and be sure to frequently dust your home and keep your pet's area, bed, etc., free from shedding dog hair. Of course, your beautiful dog will never be allergy-free, no matter how many steps you take. But by trying your best to attack its allergies from many different angles, you'd be surprised by how much itch relief you can give your pooch. Good luck! Like most Labrador Retriever owners, I pay attention to the types of dog treats that I feed and reward our dogs with. Finding health and nutritious snacks to give to our Labrador Retrievers as a treat in training or just for being the wonderful Labradors they are, can be a chore. Are the ingredients safe? What about calories? Enter Leanlix, a low calorie dog reward system that will leave them drooling for more. I came across the Leanlix Facebook page while searching the Internet for new dog treats for Dakota and Meeko. After visiting their website, I was intrigued by what I had read and sent them and email for further information and an opportunity for a few samples to try. Before long, a box of samples and company information was sent for us. Leanlix is a lean, lickable dog treat reward system, that was inspired by Grace, a 1 year old, yellow Labrador Retriever of company founder, Sharon Da Dalto. Sharon tells us that Grace would not come or obey unless food was involved, so in order to do this and keep her weight in line, Leanlix was created. With Grace being a very enthusiastic treat taker (sounds like my two Lab girls), Sharon created an easy to dispense system that allowed her to keep all fingers intact while rewarding the lickable dog treat. Formulated by a leading professional in the pet industry, to address the epidemic of pet obesity, Leanlix low-calorie reward system lets you treat your dog without worrying about their waistline. Calorie count = "3 LIX IS 0 CALORIES AND THE 3 OZ STIX IS ONLY 210 CAL." Available in six mouth watering flavors, that include fun names like cupcake on the counter, day at the beach and run-a-way frank, the Leanlix low calorie dog reward system will leave your dog drooling for more. I received the sample flavors of dishwasher diner, one and only strawberry and bark-b-q and set out to see how my Labradors, Meeko & Dakota would respond. My Labrador Retrievers are never ones to turn down a treat and were very excited the minute I opened the cap. I took turns making them go through a couple of tricks that they know and proceeded to offer a treat when finished. At first, both Labs wanted to bite the end of the Leanlix treat but after a couple of turns, they both realized there would be no treat without licking. It's best to train your dogs to lick and not bite, as the product is meant for a QUICK LIX/SLOBER REWARD. I loved the smartly packaged treat which was very easy to dispense, with no mess! The attached lanyard is a wonderful idea and keeps the treats handy during training and walks. 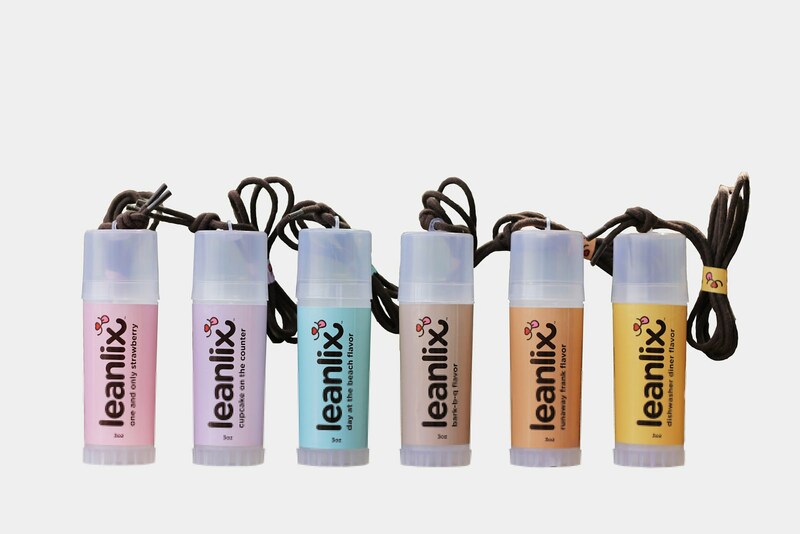 It also keeps the Leanlix treat highly visible to my dogs at all times, which helps them obey and stay focused. I was extremely happy knowing the my dogs were getting healthy treats that they loved. 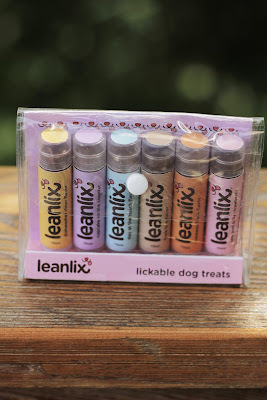 Leanlix has done a wonderful job with these products and we are happy to recommend a dog treat / reward system that's convenient to use and dog-pleasing, without adding calories. We give the Leanlix Low Calorie Dog Treat / Reward System a 10 out of 10 paws! 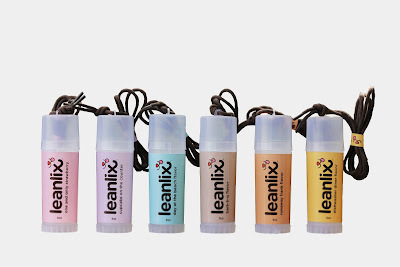 Visit the Leanlix website and let us know which flavor your dog would like to try. For a second entry, become a Fan on the Leanlix Facebook page. This giveaway is open to residents of the United States only, 18 or older and will end at 11:59 PM EST on 9/27/12. The winner will be selected by random generator and the entries verified. The winner will then have 48 hours to claim their giveaway prize. If the winner does not claim their prize within their 48 hour period, a new winner will be chosen. You must leave an e-mail address (or have it available in a profile) so that I can contact you if you are the winner. Be advised, comments are moderated. UPDATE: Congratulations to Brittany Whitley for winning the Leanlix Low Calorie Dog Treat / Reward System Giveaway. An email has been sent out for your information Brittany. To dog owners, a canine is more than a pet; it’s a family member. You obviously love your four-legged friend, and having a good house built for them to sleep in after a hard day of playing outside is important. Have you never built a doghouse before? No worries. From the planning stages to the finishing touches, this handy step-by-step guide will help you build a home for your beloved dog in no time at all. Before you go launching into the building, you need to make certain you have the woodworking tools necessary to complete a build. You can construct an entire doghouse using nothing but hand tools, like a saw and hammer, but you might consider using an electric or battery-powered screwdriver or circular saw to save you some time. Plan to build the doghouse to fit your dog after it is fully grown. Some dogs grow very quickly, and you don't want to replace doghouses like you'll have to replace collars. Also note that pressure-treated woods are treated with chemicals that can be toxic to your dog. If you must use pressure-treated woods, make sure you don't use them on any part of the house that your dog can come in contact with. When you measure the wood for the foundation, plan to give your dog enough space to go all the way into the house and turn completely around. Then, using 2x4” boards, piece together a frame for the foundation that will keep the whole house together. Nail or screw these boards together at the corners. Cut a piece of plywood to act as the floor of the house, and then secure it over the frame using nails or screws. If your doghouse is particularly large or your dog will be heavy, consider using 2x4” boards as support beams beneath the plywood. Again using 2x4” boards, build a frame for the two sidewalls. Use a 2x4” board in the center of each wall for support. Make sure to secure each piece of wood with either nails or screws. When building the rear wall, place the center stud about 2 inches off center to allow for the roof strut. Now, build the frame for the front wall. Since there will be a space for your dog’s entrance on this wall, do not use a center stud. Measure, cut, and fit 1/2” plywood over the wall frames. On the front wall frame, use a saw (preferably a jig saw) to cut a hole large enough for your dog at full-size to easily enter. Attach these walls to the foundation using screws or nails through the bottom of the wall frame. Using 2x4” boards, place and center the front and rear roof struts at the top edge of the front and rear wall frames. Nail or screw these into place. Determine how much overhang you want with the roof, and cut the top ridge board for the length of the doghouse plus the desired overhang. Position it and nail it on top of the struts. Cut three rafters per each side (a total of six). They will need to be mitered to fit the angle of the roof. These rafters will be notched to fit on the wall frame of the house. Using the front edge of the house and the ridge board overhang, mark the notches with a pencil, and then cut them with a saw. Attach the rafters where they meet the wall frame. Measure and cut the overhang rafters. Attach them to the top ridge board. Cut two pieces of 1/2” plywood to fit the roof, and then attach using nails or screws. Shingling a doghouse roof will keep the house in better shape for a longer amount of time. Overlap the shingles neatly as you attach them to the roof. The hard part is finished! Decorate the doghouse to your pooch’s personality, with paint or any other decorations. Add some straw or some carpet to help your dog stay warm at night. This is your opportunity to make the project your own. Guest Article Author Bio: Maire is an animal lover and home fixer upper. She enjoys writing too, especially on behalf of Sears and other brands she trusts. Walmart is offering everyone an opportunity to try Waggin’ Train Chicken Jerky Tenders Dog Treats. Waggin’ Train Chicken Jerky Tenders are a wholesome, healthy treat for your dog. They are made with premium chicken breast filets and have only two main ingredients: natural chicken filets, and glycerin (a natural preservative to retain moisture and texture). These high-protein, low-fat treats are slow-baked to seal in the natural flavors for a healthy and wholesome snack. Chicken jerky treats are popular because they are a high-quality, great-tasting treat that dogs love. To try a Free Sample of Waggin’ Train Chicken Jerky Tenders Dog Treats, click on the third bubble under the pop up window that appears and then click the sample link. To learn more Waggin’ Train Chicken Jerky Tenders visit the Waggin’ Train website. For those of you who have followed the All About Labradors blog for a while, you know that we love to pamper our two lovable Labrador girls. Daily brushing, the occasional bath, nails done and fragrant sprays all keep out lady Labradors beautiful. So an email from Fucini Productions, asking if I was interested in participating in a survey regarding the fragrance of Cardinal Pet Care’s Viva La Dog Spa Facial Wipes, excited me with another possibility to keep our Labrador Retriever clean and smelling pretty! 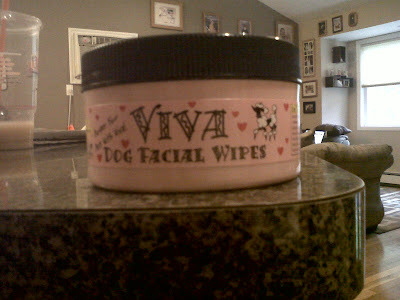 As per Cardinal Pet Care, Viva La Dog Spa Facial Wipes are for customers who are afraid to wash their dog's face and get soap in their eyes. They are also for dog owners that like to wipe their dog's face after they eat and/or drink. All of Viva La Spa's products are cruelty free, and they are manufactured in the USA in a 100% solar powered facility. Made in containers that are recyclable, all of their solutions are biodegradable. "Natural Dog Facial Wipes have a mild cleanser of water, aloe vera and witch hazel with extracts of Chamomile, Rosemary, Raspberry and Sage. Pro-Vitamin B-5 (Panthenol) and Allantoin condition the coat and skin. Cucumber Melon fragrance will leave you smelling fresh and clean!" 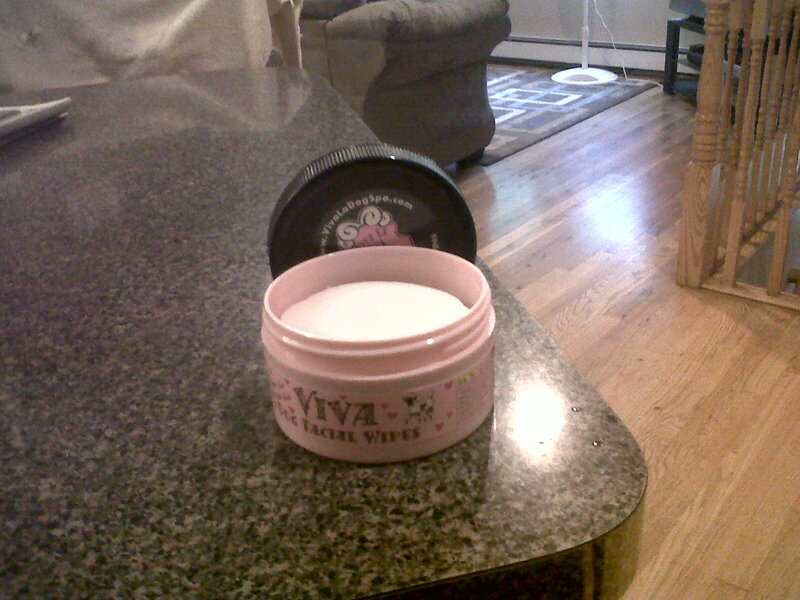 After receiving the product and opening the jar, I was pleasantly surprised by a clean and fruity scent. The scent was not overpowering, but at the same time, wasn't to light to help get rid of that occasional doggy smell before bathing. The cute, pink round jar contained 45 facial wipes, which were fairly easy to pull the wipes out of (occasional sticking of wipes occurred). Each wipe was very moist and I felt was a sufficient enough size to wipe each of my Labrador Retrievers faces (one wipe per each doggy face). I also used another wipe each to clean their paws. Now, the product is not made for the whole dog's body (maybe if you have a smaller dog) but I gave it a shot anyway. Used a bunch of wipes on each and thought they worked well. Hint to Cardinal Pet Care, maybe a larger wipe for the whole body can be produced for us bigger dogs! The Viva La Spa Dog Facial Wipes did a wonderful job in freshening and cleansing the faces and paws of our Labrador Retrievers. I had no problems using it around their eyes and the scent didn't affect either one of them. As for the scent, it did last for a short while, but dissipated soon after our Labs went outside and then returned. We give the Viva La Dog Spa Facial Wipes an 8 out of 10 paws and have no problem recommended it to others. If you want to learn a little more about Viva La Dog Spa or their other products, visit them at Viva La Dog Spa or Viva La Dog Spa on Facebook. Disclaimer: I would like to thank Nancy Bakanowicz at Fucini Productions on behalf of Cardinal Pet Care for the opportunity to review the Organic Diatomaceous Earth Flea Bar. The opinions within this post are of my own and I was not influenced in any way. I was not compensated in any manner, other than the product to to try and then record our thoughts in a survey. I was not required to blog about Viva La Dog Spa Facial Wipes but choose to share the product because I thought it was a good product. My reviews may not always positive, but they are my personal and honest opinions. Please conduct your own research before purchasing products. For more information about All About Labradors please read our Disclaimer and Disclosure Policies. Reward your Labrador Retriever with a Free All Natural, Oven Baked, Healthy Dog Biscuits Sample from Angelic Dog Treats! "Our oven baked biscuits are made with all natural, premium ingredients including tasty grains, vegetables, fruits and herbs. Our Dog Biscuits are available in a variety of dog-drooling flavors." To get your Free Sample of All Natural Oven Baked Dog Biscuits, you must become a fan of Angelic Dog Treats Facebook page and fill out your information. "Free sample offer is for new fans only. Limit one sample per household. USA and Canada only while supplies last. Promo valid until: 11/14/2013 08:30pm"
Millions of people all across the globe wear contact lenses. It's a routine for many, like falling asleep at night. But how routine is it for dogs to wear contact lenses? Since the 1970s, veterinarians have been using contact lenses for various reasons. Although it may seem quite odd, these specially designed contact lenses have greatly improved the lives of many dogs. The contact lenses placed in dogs are similar in appearance to regular contact lenses, but they are used for different reasons. Lenses that dogs use are a bandage for the eye, more than anything else. Traditional treatment for a damaged cornea in a canine is painstakingly difficult, for both the dog and its owner. It involves regularly dropping antibiotics into the damaged eye and using an eye flap that the dog is unable to see out of. In comparison to the method used with contact lenses, this method is very inefficient. By treating cornea problems with a contact lens the eye will heal in less than half the time it takes with the traditional method. The medication is placed on the contact lens, which is then inserted into the eye. With contacts, antibiotic drops are completely unnecessary. If a dog is experiencing difficulties with an eye, it should be taken to the vet as soon as possible. If the problem can be fixed with contacts, then the owner is in luck. Contacts are inexpensive and application is easy: The vet creates contacts that are comfortable for the dog and applies any necessary medication. Once the dog is wearing the contact, it will be worn for approximately a week, until it falls out on its own. After this happens, the owner should take the dog to the vet once again, to make sure the eye is completely healed. In the event where the eye hasn't fully healed, the veterinarian will call for another contact to be made or alternate medicine to be used. Failure to take a dog with eye problems to the vet can result in unnecessary or permanent damage. In some cases, an eye will get so bad to the point where it will have to be removed. Any owner who wants the best for their dog should talk to a veterinarian about contact lenses in the event of cornea damage. How Contacts are Helping Dogs is a guest post by Jamie Lechler. Jamie Lechler writes for EZ Contacts of the USA, which sells contact lenses online. For a successful case study of contact lenses on a dog, visit the NIH.